One person said, recalling his father, "I never liked you, but now I forgive you." Seoul, South Korea -- With the echo of a ringing bell heralding the end of the day, several Buddhist monks and a group of visitors enter the centuries-old Buddhist sanctuary of Magok Temple in Gongju, South Chungcheong province, and start to pray amid a thousand Buddha sculptures. The sounds of wooden blocks clapping and the chanting of Buddhist scriptures blend with the burbling of water flowing through a nearby valley and the humming of cicadas, creating a solemn atmosphere. Then the visitors begin to write their wills on pieces of paper, before burning them and scattering the ashes in water. The act caps their three-day residence at the temple. Temple-stay programs have diversified since they were introduced three years ago, and cater to a broader part of the population. Among the many programs offered by temples nationwide, one stands out for its unique mixture of meditation, sightseeing, hiking, worshiping, and most of all, group therapy. Magok Temple has been offering the programs for specific groups such as married couples, families, divorcees, orphans, jobseekers and the unemployed, as well as just about anybody else, but the programs targeted at specific groups have been the most successful. "After organizing temple-stay programs for a long time, I realized what participants want," said Maga, the priest in charge of the programs here, when asked why he included group therapy. "They want to release what they have kept inside their mind." The increasing popularity of temple-stay programs has made celebrities of a number of Buddhist monks who organize the programs. Maga, who gives lectures at Chungang University, is one of them. The temple-stay program in Magok Temple has much in common with other temple programs, such as vegetarian meals, early morning meditation and worship, including baekpalbeonnoe, the 108 bows, but unlike the other programs, it eschews rigid religious discipline. This time, the program was for young jobseekers. The program started at noon with vegetarian lunch followed by a brief tour of the temple, whose history dates back to the 7th- century Baekje Dynasty. Twenty young participants, men and women clad in Buddhist robes, gathered in a large room and began a session called "Opening Heart," in which they got acquainted with each other. A female monk Myoun directed the gathering and told the visitors to sit in a circle and to write on a piece of paper a nickname to describe themselves and 10 good things about themselves. Then they stood up one by one and talked about themselves. Rather than mentioning material aspects about themselves, they talked more about their personalities and relationships. "My id is Echo. I smile a lot, have good relationship with friends, have good manners, obey my parents and easily adjust to new environments," a female student said. Some people came just to stay in a temple while others had a clear purpose: they sought inspiration. "I am over 30, and working, but the work I do is not something I like to do," said a female volunteer and participant. "I want the temple-stay program to help me make a change. I want a new career. I want to use this opportunity to help me make the leap." In the evening, the guests ring a large bell in the temple to welcome the nightfall. After dinner, they take turns complimenting each other. The three-day program may seem rigorous to some people ? every day begins at 3 a.m. The second day started with worshiping and 108 bows before walking on the mountain. The schedule also includes walking on a mountain path with bare feet in the afternoon and a hot spring bath, as well as meditation. Although several hours each day are dedicated to worshipping, the program does not force its religious doctrine. The openness is one reason why many people participate in the program regardless of their religion. "The program does not overly emphasize religious aspects. We don't ask what kind of religion they believe in," Maga said. "What lies in the center of the program is human love." "What I liked about the program here is that it did not push me to choose one religion over another, and I enjoy mountains," Kim Ki-suk, a graduate student at Korea University. Ms. Kim said this is the second time she took part in the program. "Unlike other religions, it says I am the best person, and guides me to look into myself." The program reaches its climax on the second night during a session titled, "Like scattering clouds: meditation of death," in which people write their will on a piece of paper. It is at this point that the program reaches its emotional peak. After they finished writing their wills, everyone started reading them, one by one. They read their last messages to their friends, family and coworkers. Some people cried. One person said, recalling his father, "I never liked you, but now I forgive you." Through this experience, the participants have a chance to reflect on their life and a chance of rebirth, Maga said. On the third day, the program concludes with a session titled "I am a Worthy Person," in which each person takes turns to sit at the front and other people kneel down and vow to the person in front of them. "Buddha said every living thing is considered Buddha. The visitors are treated as if they were equivalent to Buddha, and they are deeply moved by it," Maga said. "The sense of being moved is what's most important in religion. This helps people get out of the situations which they are in." Though the program differs for each group, after going through sleepless nights and painstaking bowing the program's coordinators see apparent changes in the participants. "Married couples, or parents and their children, who were aloof from each other start opening up and develop warm feelings for one another," Myoun said. "It is most worthwhile when each and every one becomes able to find their way to carry on," Maga said. "Some of them bring their family the next time." Magok Temple provides the program for a small group of foreign visitors, but to some extent it is done separately because no Buddhist monk is proficient in English, said Iris, a Korean-Canadian woman who coordinates the program for non-Koreans. Doing a temple stay involves more than simply staying in a temple: it is a cultural program to experience Buddhist monastic life and its blend of nature, culture, tradition and inner peace. The number of participants, both Korean and foreign, is rising sharply every year, but why? Most participants say they simply want a chance to rest, to escape from the daily grind and slow things down. The world is becoming increasingly complicated and difficult, and matters of daily survival in a competitive modern economy force people to constantly push themselves, they say. People become burned out. Homes are no less demanding than workplaces. Children compete fiercely to get the highest grades but no longer communicate with their parents. But the increasingly fast place of life is being met with more leisure time, especially with the adoption of the five-day workweek in Korea. Having a weekend off allows people to get away from the city and look for answers to their most personal questions. More temple-stay programs therefore are focusing on what they call "self-actualization." Although the details differ for each program, most involve worshiping, meditation and the 108 bows. Participants are encouraged to see themselves as valuable beings. The periods of silent introspection are supposed to give their bodies and souls time to cleanse themselves. When one's body and soul are clean, forgotten pains and repressed wounds are said to resurface. These are supposed to be dealt with by training the mind. Participants discuss painful family experiences, often breaking down in tears, and then look back on their life and write their will. The participants usually vow to live a better and purer life. Repressed memories unwind and gush out and participants say they feel relaxed, as if a great burden has been lifted from them. More silent meditation and worshiping is then recommended, to lead them to peace of mind. Two-day program costs 50,000 won ($49) per person. For more information, call (04) 841-6220~3 or visit www.magoksa.or.kr. Magok Temple's stays focusing on metta meditations under the theme "Me, You, and Us Together" are perhaps the most popular. Other themes of temple stays include healing meditation for those who have been hurt physically or spiritually, fresh starts for the divorced, forgiveness and love confessions for spouses, beautiful twilight years for the elderly, and encouraging programs for young unemployed people. 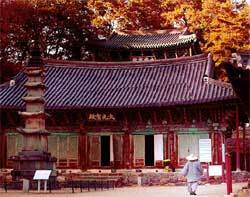 Daewon Temple in Boseong, South Jeolla Province, offers a program entitled "Let's Prepare for Death." It teaches how to perform prayers for the dead, draft wills, and pray for your own soul.